Winter Bonefishing Revisited – Drop That Snow Shovel! 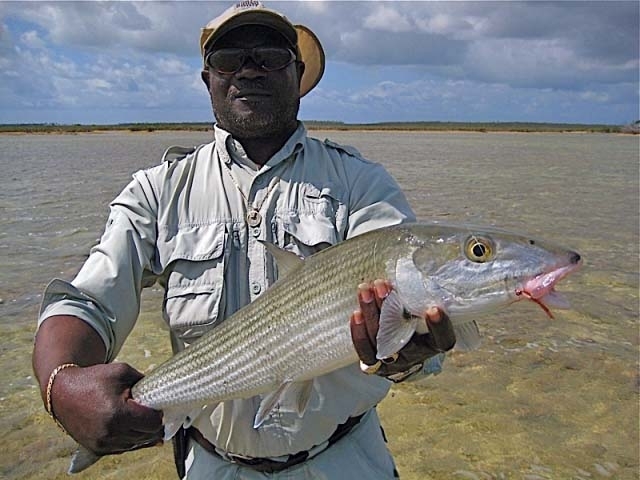 The Bonefish & Tarpon Trust’s August “Conservation Captain of the Month” is veteran guide Capt. Bob Branham. Bob fishes the Key Biscayne and South Biscayne Bay areas and has been guiding for 35 years. When asked to tell a favorite fishing story, he recalled a day of cold water bonefishing, excerpted from the Bonefish & Tarpon Trust Blog below (read the full blog here: http://blog.bonefishtarpontrust.org/?p=2619). 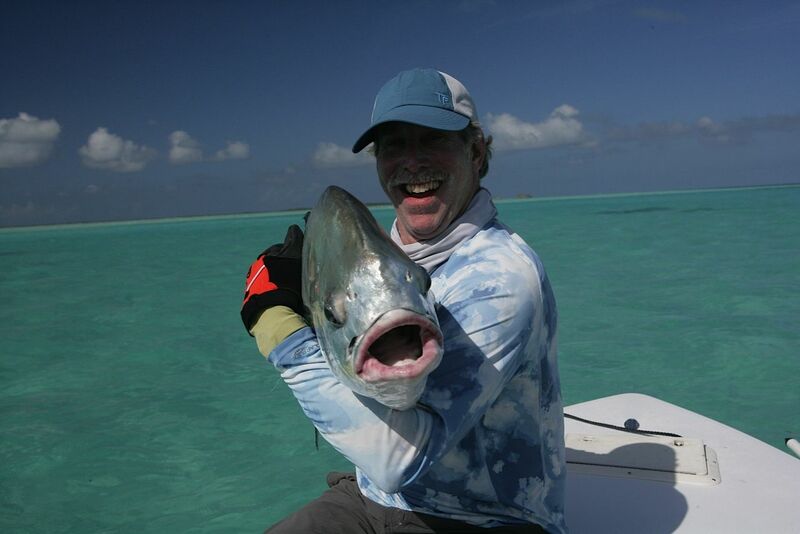 Bob’s story couldn’t help but remind us of Doug Schlink’s Blog post on Winter Bonefishing in the Bahamas (https://angleradventures.wordpress.com/2011/09/28/bonefishing-in-winter-water-temps/). (BTT) Tell us one (or two) of your favorite fishing stories. (BB) Years ago in March we had a strong cold front pass through. It was a sunny and windless day but the air temp was low 30′s- I had ice on my windshield when I got in my car. My customer was from Toronto and when he showed up I told him it was a no-go – water temp was 54 deg. and there was no way we would see a bonefish. He looked at me and said that he had to get out of the house as his kids were out of control and his wife had some honey-do’s lined up if he stayed home. He mentioned that it looked like a beautiful day to him – he was in shorts. I put on my down parka and off we went. We were headed south in hopes of maybe catching a ‘cuda or something and when I got to Stiltsville, I couldn’t believe it. Bonefish mud was all over this flat. It seemed like every bonefish in the Bay was there, feeding hard. We stayed on that flat all day and hooked 30 fish on fly – none was less than 7 lbs. It did warm up a bit. Air temps hit 65 deg. and water temps came up to the low 60′s. – still way too low for bonefish or so I used to think. 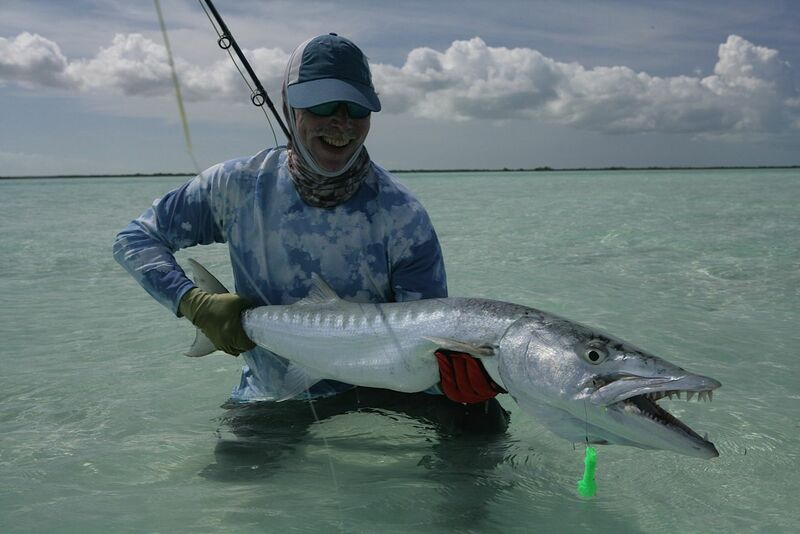 So, if you’re interested in BIG bonefish, and being shin-deep on a tropical flat waving a fly rods sounds more appealing than being knee-deep in your driveway schlepping a snow shovel, check out our Bahamas Lodges at http://www.angleradventures.com/Bahamas.htm, give us a call at 800-628-1447 / 860-434-9624, or drop us an email at info@angleradventures.com. The bonefish in the photo above is a 14-pounder landed in February off the north shore of Grand Bahama. Carl Heilman, who landed this monster, also landed a tarpon (the group jumped 3 and landed 2). Chris Bamford landed the other tarpon, as well as the triggerfish, John Wilson jumped a tarpon and Scott Trerotola landed a 10 lb Mutton Snapper that was cruising behind a Ray. Each member of the group also landed several bonefish between 5 – 10 pounds. Bill & Liz Aldendifer also had a fantastic trip to Grand Bahama. Together, they landed several fish in 7 – 8 pound range, a couple 9 pounders, a 10 pounder, and a 12 pounder on Bill’s birthday. Bill came close to having a 14+ pounder in hand, but lost it at the boat when the guide grabbed the leader. Bill, a permit aficionado, said that the 14+ pound bonefish fought harder than any permit he’s hooked, even his 30 pounder in Ascension Bay. All of the above mentioned were Angler Adventures’ clients staying at North Riding Point Club. Click or Tap here to see Bill, Liz, Scott, and more photos of our clients with their fish on our Facebook page. Replacing Tim and Mercedes at North Riding Point Club (NRPC) is veteran lodge manager Paul Adams. Originally from Indiana, Paul was raised in the Bahamas, while his parents managed Deep Water Cay from 1976 – 1984. Paul attended school in McLeans Town, where he became friends with many of the famous Grand Bahama Guides, including NRPC head guide, Stanley Glinton, who taught Paul how to pole a skiff. Paul’s fly fishing instructor at an early age was none other than well known sportsman and author, AJ McClane. Paul and his wife Alison also managed Deep Water Cay for 8 years, from 1996 – 2004. Paul’s local knowledge, hands on management style and angling experience make him the perfect choice for this position. North Riding Point Club (NRPC) has acquired 5 new 17-foot Hells Bay Marquesa Skiffs with 90 HP Yamaha 4-stroke outboards and new trailers. NRPC has also upgraded their fleet of vehicles with a couple of newer Ford Explorer SUVs. The boats are equipped with padded seats, leaning bar and power poles. The Hells Bay skiffs have been in use since January 2013 and clients and guides alike are raving about the comfort and speed, especially when making the run to Sale Cay. For reservations, or more information, please call Angler Adventures at 800-628-1447 or 860-434-9624 or send us an email at info@angleradventures.com. 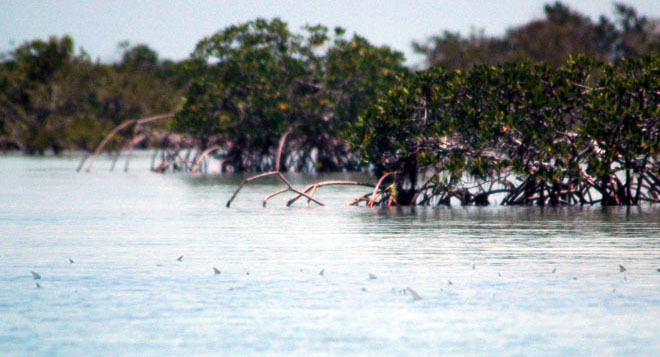 Most anglers identify South Andros as a huge expanse of wadable flats around the southern and southwestern tip of the island: Flats filled with large schools of uneducated bonefish in the 2-4 pound range eager to eat flies. Anyone interested in seeing larger fish in singles and doubles would gravitate the North Bight of Andros, the West Side of Andros, or the North Shore of Grand Bahama. Think again! Over the last few years, more and more clients fishing Bair’s Lodge, Andros South, Pleasant Bay or Mars Bay are catching big bonefish. The 7 – 10 pounders are being landed every month. 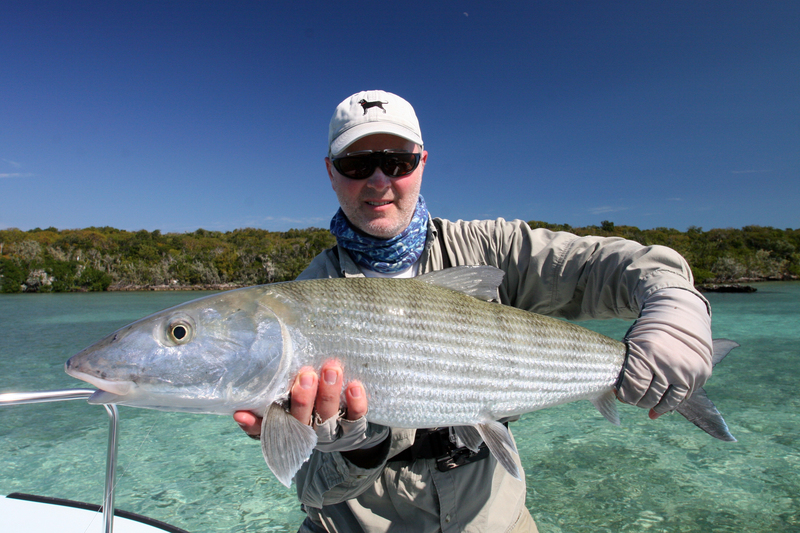 Mars Bay has kept a record of the bonefish caught this season, here are some highlights. 1) The numbers of fish being caught over the spring and neap tides are virtually identical, but the “moon” tides are producing bigger fish. 2) Anglers are landing good numbers of fish in the 27” – 31” range in each month. 3) The largest bonefish landed was an astounding 36”. To put some of this into perspective, and provide information on how to estimate the weight of your Atlantic bonefish, please refer to the table below, which has been excerpted from page 20 of Randall Kaufmann’s Bonefishing!. This method of estimating weight is not as accurate as [girth2 x length / 800], however it does highlight the massive size of a 36” bonefish! For those of us with ruler marks on our rods, it also provides an easy way to estimate the weight of our bonefish and minimize the amount of time spent handling the bonefish (click here for best practices for on handling and releasing bonefish). Go ahead and speculate why there are so many more big bonefish being caught on the South Andros flats. It could be cyclical, climate change, guides getting better at finding bigger fish, or better anglers doing the fishing. With anglers landing plenty of fish in the 7.7 to 11.9 pound range, our conclusion is that this might be the best time to fish South Andros. One of the biggest mistakes a bonefisherman can make is failing to adjust his fly to changing water depth. Your fly should be weighted such that it sinks quickly to the bottom and then stays near the bottom within view of the fish after you begin stripping. If you strip the fly above a bonefish, it will never see it. The average flat depth, whether you’re wading or poling, ranges from 1-2½ ft. In this depth, a Gotcha or Amber Shrimp with medium sized bead chain eyes should provide close to the perfect sink rate, without overweighing the fly (and potentially spooking the fish). A good rule of thumb is your fly should reach the bottom in about 3 seconds. If you find your fly is not getting to the bottom, you should switch to a fly with lead eyes or add a few wraps of lead wire to the eye of the fly. The angler who is willing to fish deeper flats will often be rewarded with the largest bonefish. 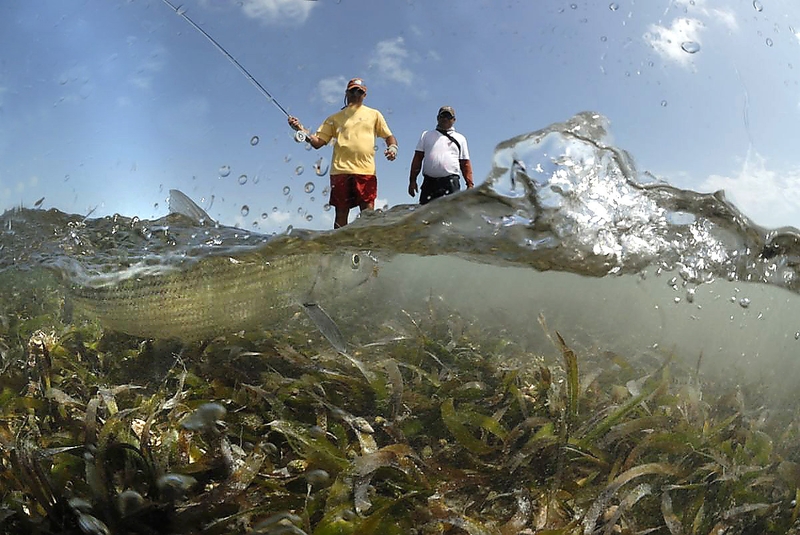 Big bonefish prefer the protection of deeper flats or shallow flats close to deep water. When you’re fishing water 3-4 feet deep, you’ll need a fly with lead eyes to get to the bottom quickly. Proven deep-water flies are the Clouser minnow (especially tan and white and chartreuse and white), the Simram, (a rabbit fur version of the Gotcha fly with lead eyes) and Henry Cowen’s Bonefish Scampi. Lead eyes come in a variety of weights and for joy of casting, you’ll want to carry flies with the smaller lead eyes, as well as the heavier lead eyes that cause many of us to duck when forward casting. The last thing a bonefisherman wants to do is scare the daylights out of an actively feeding fish by casting too heavy a fly too close to the fish. Therefore, you must go light in skinny water. By light we mean no weight other than the weight of the hook. For this we recommend mono (or plastic) eyes and a body that lands softly. A well-designed fly for this situation is a pattern called the bunny bone in sizes 4, 6, and 8. The bunny bone is made with rabbit fur, rug yarn and mono eyes. You can throw this unweighted fly quite close to a tailing fish. Its entry into the water is soft, but it sinks well. The rabbit fur makes it look alive even before it’s stripped. All you need to do is give it the tiniest of strips. Don’t strip the fly too far or too fast when working a tailing fish. Before you begin fishing it is also advisable to have a handy selection of the flies you’re most likely to use that day. Have a selection that covers all water depths, so you are prepared when a quick change is required. For even quicker adjustments to changes in water depths, have a spool of lead wire handy and wrap a small piece around the eye of the fly, as needed. 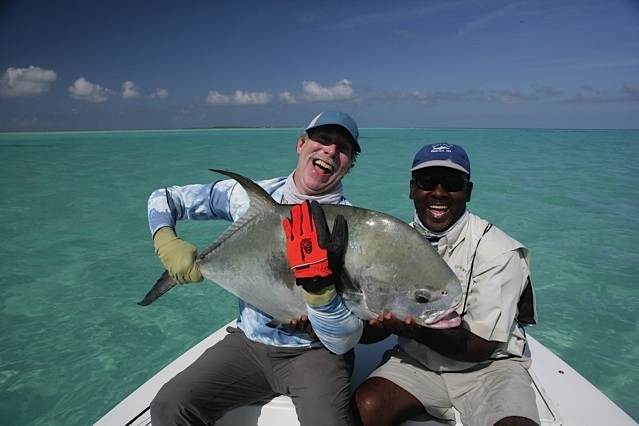 This was another except from the Angler Adventures “Bahamas What to Bring List”.